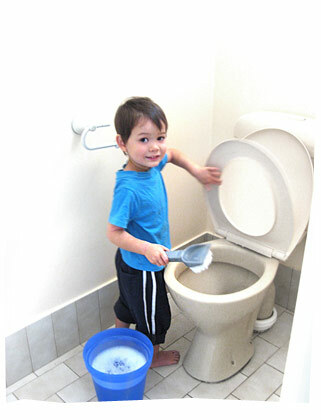 My project for today was to clean the toilets and bathrooms – in preparation for our up-coming Christmas parties. Usually I plonk my boys in front of a DVD, because it’s so much easier and faster if I do these things by myself. But today, my boys really wanted to help. So with a sigh of reluctance, I let them. I gave them a bucket of soap, a brush and let them loose. My goodness. They had so. Much. Fun. I couldn’t believe it. They were cleaning for almost 2 hours. Of corse, they got completely wet in the end, but hey, the toilets and bathrooms were sparkling! I think the funniest bit was watching my 5.5yo do a kind of break-dancing tumble in the bath, because he wanted to polish it with the clothes on his body. « Weekend of Christmas Overload!